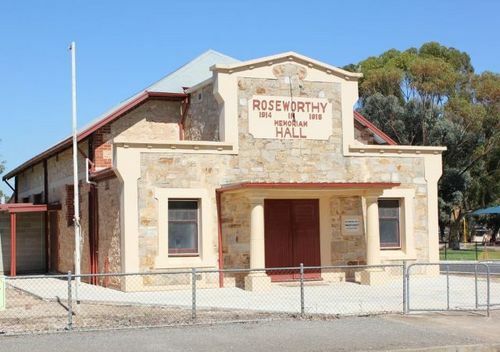 Roseworthy Memorial Hall was erected in memory of those who served in World War One. The hall replaced the original hall which was opened in 1919. On Saturday afternoon, August 3rd at 3 p.m., the stone laying of the Roseworthy Memorial Hall will take place, the honor to be carried out by Mr. Thos. Stirling, a recognised old resident of the district. A public ceremony has been arranged. The chairman of the Building Committee (Mr. John Carmichael) will give the facts that led up to the decision to build a new structure, and, Mr. Perc. Carter will give the financial situation up to date. It is also expected that the chairman of Mudla Wirra Council (Cr. Elliott Day) will speak, and the District Parliamentary representatives Messrs Crosby and Rudall, are expected to speak and compliment the district on its community welfare. Following the stone-laying ceremony, afternoon tea will be served in the day school adjoining the hall allotment ; and at night a promenade concert, dance and supper will mark the occasion as a period of rejoicing. Bunyip (Gawler SA), 26 July 1935.